Though I focused on the problem of state sovereignty in the last post on the Roberts Court, I've been trying to sort through some of the other bizarro rationales that the conservative justices used to make these decisions. I am especially confused about Roberts and his opinion of Congress. Let's start with Shelby, the Voting Rights Act case. Congress, in a rare display of conscientiousness, undertook an exhaustive review of the voting rights and discrimination patterns in the South before choosing to reauthorize the VRA in 2006. What they found were hundreds of examples of discriminatory practices expressly designed to erode or dilute the political voice of minorities, mainly through voting practices. It seemed pretty logical, then, to re-up the VRA. But history did not end in 1965. By the time the Act was reauthorized in 2006, there had been 40 more years of it. In assessing the “current need” for a preclearance system that treats States differently from one another today, that history cannot be ignored. During that time, largely because of the Voting Rights Act, voting tests were abolished, disparities in voter registration and turnout due to race were erased, and African-Americans attained political office in record numbers. Can you name any African American governors from former Confederate states? Mississippi is over 37% black... can you name an African American governor or senator ever elected there? 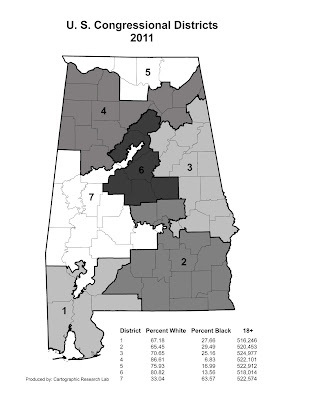 Alabama, home to Shelby County, is over 25% black. Can you name an African American governor or senator ever elected there? True, conditions in the South have impressively improved since passage of the Voting Rights Act. Congress noted this improvement and found that the VRA was the driving force behind it. 2006 Reauthorization §2(b)(1). But Congress also found that voting discrimination had evolved into subtler second-generation barriers, and that eliminating preclearance would risk loss of the gains that had been made. Plus covered districts always have the option of appealing for "bail out" under the terms of the VRA, a process in which they prove a history of nondiscriminatory behavior and, upon successful appeal, become exempt from Section 5 preclearance. So the VRA itself accounts for progress in these areas and provides the mechanism for districts to become unburdened of federal oversight. But the real issue here is that Congress went through all this evidence and Congress decided the evidence was sufficient to reauthorize the act. Roberts himself admits that Congress has the power to pass this legislation, that the VRA is thus Constitutional, if the evidence is sufficient. (This point is lost on the Washington Post conservative editorialist Jennifer Rubin, who compensates for her deep limitations with her great talent for setting up straw men.) His entire opinion is based on his contention that the evidence isn't sufficient. Now if that were true, wouldn't we expect a relatively contentious floor debate in Congress over reauthorization? And wouldn't we expect a relatively close or divided vote, as different members of Congress arrived at different conclusions based on ambiguous evidence? So in the states most affected, not only did 43 of 43 Democratic Representatives find the evidence sufficient, but 64 of 84 Republicans (all of them white) did too. As for the 2006 Senate vote on the VRA, that is much easier to parse: it was 98 Ayes, 0 Noes, 2 NVs. John Roberts must believe he has special insight into the same evidence that convinced Congress to overwhelmingly pass a bill he believes is unnecessary. And this last enactment, not a single vote in the Senate against it. And the House is pretty much the same. Now, I don't think that's attributable to the fact that it is so much clearer now that we need this. I think it is attributable, very likely attributable, to a phenomenon that is called perpetuation of racial entitlement. It's been written about. Whenever a society adopts racial entitlements, it is very difficult to get out of them through the normal political processes. By this reasoning, members of Congress can't appear to be against African-Americans or minorities because... well, I don't know what would happen. Does Scalia or Roberts think the liberal enforcers of political correctness would magically throw them out of office? Who do they think these politicians are fooling? Here, for instance, is a map of Alabama's Congressional districts after the 2010 census. Shelby County is part of the blatantly gerrymandered 6th district located in the middle of the state. Its ridiculous shape and the fact that it is over 80% white, while it borders a district that is 63% black, kind of give the race-based politicking away. regarding the debate to pass DOMA in 1996. Channeling the logic of Plessy v. Ferguson, Roberts cannot bring himself to admit that a law defining marriage as the sole privilege of heterosexual couples carries with it an implicit condemnation of homosexual marriage, or that the politicians who voted for it explicitly espoused these prejudices. Civil laws that permit only heterosexual marriage reflect and honor a collective moral judgment about human sexuality. This judgment entails both moral disapproval of homosexuality, and a moral conviction that heterosexuality better comports with traditional (especially Judeo-Christian) morality. Brushing aside such statements because they are too inconvenient to acknowledge openly, Roberts is more than willing to point to the lopsided vote in favor of DOMA in 1996. It's not as lopsided as the vote for the VRA in 2006, but apparently the vote matters when heterosexual marriage is on the line, not when voting rights for minorities are threatened. And with DOMA, the motives of Congress were above reproach, despite evidence to the contrary. When the VRA was passed, however, Congress could not be trusted to read the evidence correctly, nor vote their real political desire. For a man who champions judicial modesty, I am struggling to make sense of such a capricious regard for the legislative branch that allows him to decide a case in whatever way he wants. There have only been two African American governor of Confederate states: P.B.S. Pinchback who was governor of Louisiana for 35 days between 1872-1873 and Douglas Wilder, governor of Virginia from 1990-1994. There have been only 4 African American governors in US history. Hiram Revels and Blanche Bruce were both African American senators from Mississippi in the 1870s. None have been elected in the modern era. There have been 8 African American senators in US history, only one a woman and only three who came to office by direct election. Alabama has never elected an African-American governor or senator. But as John Roberts would point out, history hasn't ended just yet. Edited 6/30: Originally the answer supplied for the first question only listed P.B.S. Pinchback. Now corrected to include Douglas Wilder. Thanks to reader JW for the correction.